“Buddhism is a teaching of non-violence, kindness, and compassion, as well as respect and appreciation for all living beings. Being harmonious and peaceful with everything that exists is the foundation of the entire teaching of Buddha Shakyamuni. The great teacher Buddha Shakyamuni said that this is our nature—these qualities are not new ideas or dogma that you bring into your life only when you practice Buddhism. Love, kindness, and compassion are the basic nature of every living being. When we connect with this nature, it is so soothing; we feel more calm and peaceful, as well as more joy and satisfaction. Therefore, as we practice and reflect on life, death, and dying, the Buddha always emphasized that we should ignite our basic goodness qualities of love, kindness, and compassion, which in Buddhism are known as “bodhichitta,” or the “mind of enlightenment.” This will help us better understand the meaning of the natural rhythm and process of life and death. When we look at the external world, we see that everything goes through a similar process of birth, growth, and eventually comes to an end. But that is not the final end of the process. If the perfect causes and conditions meet, new, rejuvenated qualities emerge from what has fallen apart, and the process continues. This happens with the seasons and plants and everything. Nothing ever actually ends. When something passes, it continues into the beginning of a new cycle. How do we prepare for our death and dying? The teachings always say that we should prepare by connecting to our nature. This goodness nature is the nature of the mind. There are many different ways to connect with this nature, but we should just immediately go to our mind. The mind is what is going to travel when we die. Therefore we should make a close connection to the mind itself. That is the great preparation. Connecting to the mind means touching the nature of the mind, which is love, kindness, and compassion, joy and confidence. These qualities are the nature of the mind, so we should really become closely connected to them. On the other hand, without joy, love, and compassion, even if we have everything else in the world, everything seems kind of empty—nothing gives us a sense of complete satisfaction and joy. This is because we are not closely connected to our own nature. Unnatural things cannot provide the same ultimate satisfaction as the beautiful qualities of the nature. Therefore, loving- kindness and compassion are known as bodhichitta—the mind of enlightenment. 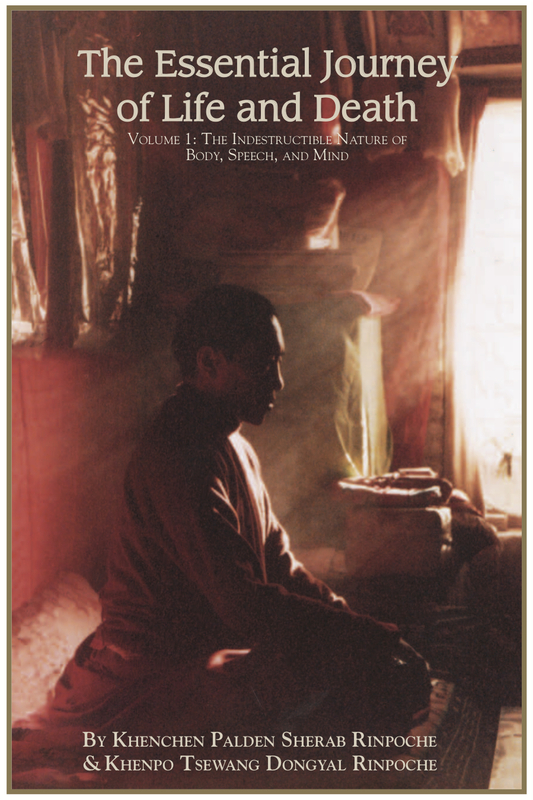 Bodhichitta is the nature of the mind. When we cultivate these qualities and feel more closely connected to them by doing more activities based on love and compassion, this is the preparation for death and dying. It is also a great reward to ourselves—it feels good immediately and leads to final, ultimate joy as well. Sharing love and compassion is also a very special gift that we can provide for others, so that everyone is more joyful and happy. It’s a great healing process. For these reasons, discovering the nature of our mind and sharing all of our beautiful natural qualities is very important on many levels and in many ways—for this life, for when we are dying, and for our life after death. We can directly experience this by looking at our own mind. For example, when we talk about loving-kindness, where is that loving-kindness? When we look and try to find and grab that love, we cannot find any solid core existing in our experience of loving-kindness. That is known as “emptiness.” And yet, there is love, which is known as “appearance,” or “clarity.” The nature of our minds is so beautiful and special. When we closely connect to the nature, we immediately experience total fearlessness. All of our doubt and hesitation instantly disappear. In their place, we find total satisfaction, joy, and confidence arising within our mind. This is what we need to practice. To practice means to closely connect to this nature. In Buddhism, this is known as “meditation.” Meditation means abiding within the nature, or being one with your own nature. When we become familiar with our nature and stay with that, we continue to carry that light now, during our dying process, and after we pass away. That light never ends. Now is the time to ignite our inner light. Then our light of wisdom, love, and compassion will shine throughout all the changes that we go through. This is why the teachings always say to prepare for death and dying now while we have every opportunity. While everything in our situation is under our control, we should prepare. If we wait until we’re dying, then even if we want to prepare for death, the circumstances and conditions usually don’t allow for that. It’s very difficult to start then. Now we are free and have every opportunity, so we should begin right now. Death is inevitable for everyone without exception. Since death is an essential part of nature’s rhythm, everyone has to go through this period. Everyone who is born has to experience dying and death, no matter how rich they are, how powerful they are, or how renowned they are. Even beings with the highest realization have to pass through the bardo of dying. This is just a passage that we all have to go through. If we experience the day, we will inevitably experience the night. No one is outside of these experiences—we cannot avoid them. This is just how the nature moves. Of course, we’re not really telling you anything that you don’t already know. Still, it’s really important to reflect on why we die. Death is a part of the nature. The immediate reason that we die is that our body declines as it grows older. The elements in our body don’t have enough strength to hold themselves together as a body. In Buddhism, these elements are called the “five elements,” which include earth, water, fire, wind, and sky, or space. In a way, our physical body is a small example of these five elements, while the external world is a larger instance of the same five elements. Buddhist cosmology describes how the external world also goes through these periods. Right now, the world seems very permanent, but it’s not going to stay this way forever. It might stay together for aeons and aeons, but in the end it will fall apart. Similarly, our body is made of the five elements. When we are young, our body is very fresh, more tangible, and light. But as it gets older and declines, eventually it loses the strength to hold itself together and it falls apart. The teachings often say that the five elements will go back to the five elements, and consciousness will depart and take off. Currently, our mind resides within a physical body that is borrowed from the five elements. Our consciousness is like a tenant, and our body is like a house. Eventually, the house will decline until it completely falls apart, and then the resident mind will go on to the next bardo. This is a general idea of how the dying process unfolds. While there are many different teachings about the body and the five elements, a simple way to explain this is that the flesh aspect of our body is the earth element, which goes back to the earth when we die. The liquid aspect of our body is the water element, which returns to the water element. The warmth of our body is the fire element, which goes back to the fire element. Our breathing is the wind element, and that returns to the wind. Our consciousness is part of the sky, or openness, and after it separates from our body, it merges with space as it travels to the next stage. When the elements of our body “dissolve,” the nutrition or energy of these elements completely merges into the outer five elements, and that is when we usually say that a person is dead. On a subtler or more detailed level, the tantric teachings of Buddha Shakyamuni and Guru Padmasambhava say that even after our last breath, we are still not completely dead. Right after our last breath, the white and red elements in our body lose their positions. At the moment of conception, our white element came from our father, and our red element from our mother. The essences of these two elements reside in two different locations in our body. The essence of the red element mainly resides below our navel center. The essence of the white element mainly resides in the top of our head in the crown chakra. Right after our last breath, these two elements lose their positions: the white element’s energy begins coming downward, and the red element’s energy moves upwards, until they meet in our heart center, where our consciousness becomes completely trapped by them. At the beginning of this life in our mother’s womb, our consciousness was also trapped by the white and red elements as we were conceived. Similarly, when we are dying, the essence energy of the two elements meet in our heart center where they almost crush together, trapping our consciousness. This is the moment when a person is considered to be totally dead since the white and red elements have completely lost their positions in our body. The bardo of dying concludes at the moment of death. During this process, the teachings often say that the dying person should connect more closely to their nature by bringing up more love, compassion, wisdom, and more confidence. You have to accept the situation. Don’t let yourself be manipulated by ego-clinging, grasping, and duality mind. Embrace the nature. Try not to be scared of this process—you have to accept it. If you’ve been practicing or developed some faith during your life, you should ignite that faith. It doesn’t matter what faith you have. You may be Buddhist or some other faith, but bring up your faith. This will support your confidence and affirm your destination. This is the time to be more relaxed, settled, and confident. Maybe it’s a bit like skydiving. We’ve never been skydiving, but it seems that after you’ve learned all the instructions and are in a plane with a parachute and everything is ready, when it comes to the final jump, it’s good to be confident—it’s good to be happy and excited, and not scared and timid of your jump. Really, your practice of love and compassion and kindness is your parachute. Have joy and confidence, and bring up your faith and devotion. It’s an exciting moment. You’re moving forward in a beautiful way towards a beautiful destination. The teachings say that it’s very important to activate all of your good qualities and not to be scared. If there are friends and family members around you, they should try not to create any kind of big emotional disturbances. Of course, the death of a loved one is a very emotional time. But try not to be very sad and cry since it can disturb the person who is leaving. Try to generate more peace and harmony, and create a more relaxed atmosphere. All of this will really help the person taking this journey to transition more smoothly. If you’re a Buddhist practitioner and have made a close connection to the great nature by practicing Dzogchen, Mahamudra, or Madhyamaka during your life, the process of your death and dying provides great opportunities for realization. The time right after the energies of the two elements join together and your consciousness is trapped in your heart center is usually very brief. It depends on the individual, but it could be only a few seconds or a few minutes—either way, it won’t last too long. Right after the energy of that joining force releases, at that moment your mind will experience the authentic nature free from habitual patterns, free from any dogma, and free from any conceptions. It is brilliant like the autumn sky. This direct experience of the true nature dawns right then for everyone, but if you’ve been practicing Dzogchen, Mahamudra, or other great meditation techniques, then you’ll be more likely to recognize the true nature. If you’re able to merge your awareness with the realization of the nature right then, you won’t have to go through any further delusions in the bardo. At that moment, you reach enlightenment and connect to the “Dharmakaya Buddha,” the experience of complete realization. The next bardo is the bardo of death. The bardo of death occurs between the moment of death and when you take rebirth. According to the Buddha, this period usually lasts an average maximum of about forty-nine days. Some people can stay one or two weeks, and after that they take rebirth, while others stay in this bardo for forty-nine days. In some cases, this state lasts for more than forty-nine days, but the average maximum of the bardo of death is forty-nine days. What will our experience be like after we die and are in the bardo of death? Guru Padmasambhava said that it will be like a dream. It’s not the same as life because there’s no physical body or environment, but still your mental body goes through dream-like experiences. What you experience depends on your past actions. In your lifetime, if you did good things that were connected with true love, compassion, and wisdom, then this bardo experience will be smooth, soothing, and overall more comfortable. If you did a lot of negative activities that caused suffering and created trouble and imbalance during your life, due to these negative habitual patterns in your mind, your experiences will arise almost like mirror images of these activities, and your journey can be a little uncomfortable, restless, and frightening. You might experience this bardo more like a struggle. In any case, it’s all just a dream-like state. The dream-like nature of this bardo doesn’t really change, but according to the actions of previous lives, one dream may be smoother and the other rougher. In either case, the experiences of the bardo of death do not exist outside of your mind. They are just imagined, self-reflected, dream-like experiences without any solidity. They are mental imaginations or reflections. If you practiced Vajrayana techniques of visualizing buddhas and other forms during your life, when you experience the illusory displays of the bardo of death, it’s very easy to connect to the imagined images and see them as your own self-display. If you immediately recognize that all of those experiences are just your mental imaginations, you will instantly stop rejecting and accepting them, and all of your feelings of hope and fear and doubt will cease. At that moment, your awareness kind of wakes up and you experience sudden realization, and all of your deluded displays end. By connecting to the “Sambhogakaya Buddha” in this way, you achieve enlightenment. The forty-nine day period of the bardo of death is not the end. After this, consciousness takes rebirth according to its karma or previous actions. The habitual force of the mind draws us to take rebirth, wherever that might be. The moment of our rebirth begins with conception, taking birth, and the process goes on and on. This is how the process of birth, death, and dying continues. Before taking rebirth, meditation practitioners have another opportunity to reach sudden enlightenment. If you have developed a good practice during your previous life, as you take rebirth you will have some control in choosing your destination and some of the circumstances of your rebirth. Instead of being controlled entirely by karma, your own intelligence will consciously choose rebirth and you will be born. This is known as immediately connecting to the enlightened quality of the “Nirmanakaya Buddha.” Nirmanakaya is the emanation quality of enlightened mind, so you consciously emanate in a new form out of your love and compassion for all beings. This completes a full cycle of the nature’s rhythm: day becomes twilight and night, followed by dawn and the sunshine of another day. Then we can have breakfast, but not only that—we get to have a birthday party! This is just a brief introduction to the process of death and dying and living according to the teachings of Buddha Shakyamuni and Guru Padmasambhava. Again, the most important time for us is this life—where we are right now. We should try to do good things connected with unconditional love, compassion, and wisdom. When we do these positive activities, we should try to be in touch with our nature, and not get caught up in too much grasping or clinging. That is the best preparation for the next stages that we’ll go through. This is what the teachings often say. The present time is very crucial and important for us—the time is in our hands, under our control, and we can do whatever we want. This is where we can make positive changes that will greatly support our future destinations and activities.